We are open 24/7. If you are having problems with your refrigerator give us a call now! A good refrigerator is an important part of every home. You use it to keep food fresh, save leftovers and generally make daily life more convenient. Imagine your life without it – how would you keep up with meals, store food so you don’t have to shop daily, or keep perishables within reach at all times? That’s why it is so important to keep your refrigerator in good working condition. Without proper attention and minor repairs when they are needed, your refrigerator might break down when you least expect it, costing you money and incredible inconvenience. To keep that from happening, call All Time Services the moment you suspect a problem with your refrigerator. 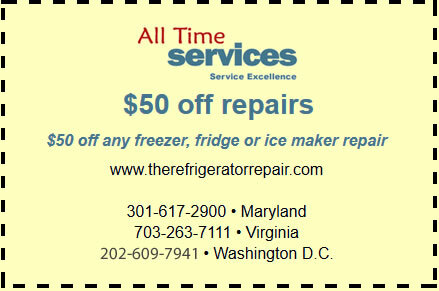 Whether you’re concerned about a bit of condensation you’ve noticed on the outside of the unit or you’re tired of listening to that loud banging sound from the compressor, call us right away for expert refrigerator repair service in the greater Washington D.C. area. The freezer (and refrigerator) should turn off on occasion. Constant running is a sign that something is wrong. Either the thermostat isn’t working properly or the compressor isn’t turning off when it is supposed to. In either case, it costs more money to operate and it is often a precursor to a broken device. To fix the problem, make sure there are no leaky gaskets or broken door joints that might allow warm air and humidity into the freezer. If that isn’t the problem, call a repair person to further inspect your device. Refrigerator Door Repairs – If you notice excess frost in and around the freezer or condensation starts to build on your fridge, the door may need a new spacer or gasket. Ice Maker Repairs – A broken ice maker can result in leaks, inefficient ice production or dirty, speck–covered ice. Refrigerator Leak Repairs – Leaks occur both in and around your refrigerator. Leaks on the ground can be from a faulty icemaker or leaky drip pan while leaks inside the appliance could be due to your evaporator coils. Refrigerator Thermostat Repairs – A broken thermostat usually results in colder than normal temperatures, freezing food in your fridge and producing excess frost in the freezer unit. Refrigerator Motor Repairs – A broken or faulty fan motor will result in loud noises, excess frost, condensation or inefficient cooling. Refrigerator Compressor Repairs – A compressor that needs repair may run constantly while still failing to produce enough cool air to refrigerate or freeze your food. Freezer Compartment Repairs – Freezer problems range from inefficient cooling to excess frost and icing due to a broken defrost timer. If you notice fridge problems like these or any others, it’s important to call a professional right away. Even if your refrigerator seems to work as intended despite the issues you’ve noticed, you put more wear on it the longer it goes without repair and in many cases, you use more energy to run a broken refrigerator. 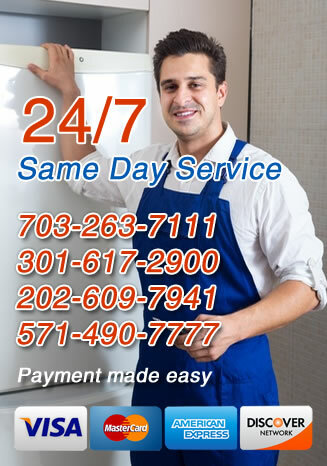 Call All Time Services now for immediate service anywhere in Arlington, VA, Gaithersburg, MD and the surrounding areas. For years, local residents have turned to us for all of their refrigerator repair needs. Give us at the first sign of trouble so we can isolate the problem and get it repaired right away and prevent any unnecessary expense.